A website allows much more complete information to be presented than is possible in a chart, including siblings and descendants, and more detailed information about each person. Photographs, maps and other images can also be displayed. All family tree research will result in a database from which a website can be created, even only a few hours. The research and formatting of this example took many hundreds of hours to complete, but the results are spectacular. 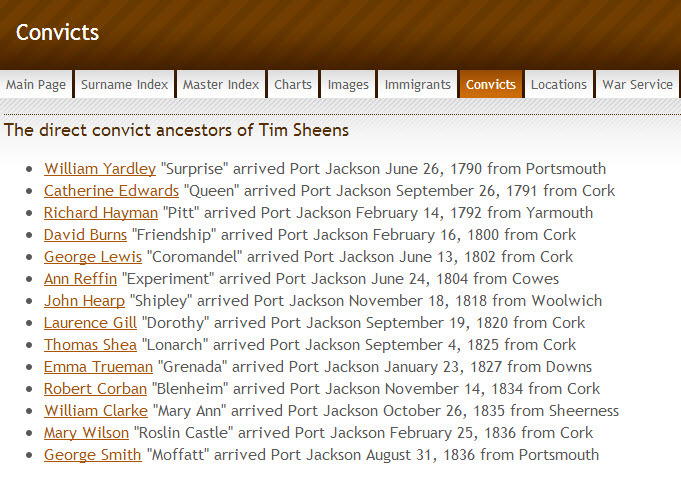 Have a look around the website for yourself, it has photos and charts and lists of convicts and immigrants and much more. The colours in the chart represent the country where the person was born. A website doesn’t have to be online. It can be placed on a CD or flash drive for distribution to family members. It will still behave in the same way as a website, with direct links to other pages, photos and charts.